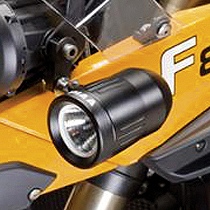 Many riders choose to make the world a brighter place – with supplemental accessory lighting. ZTechnik® Accessory Lighting Mounts give you many options for how and where to mount your supplemental lights. ZTechnik offers a variety of Lighting Mounts for GS-Series motorcycles so that you can light up your world with PIAA® or other auxiliary lights. The best way to find the Lighting Mount for your BMW® motorcycle is to use the SHOP main menu option to select your specific year and model bike. ZTechnik® Accessory Lighting Mounts are available in a range of styles to add large or small accessory lights to BMW's 2004-12 R1200GS, 2006-12 R1200GS Adventure, 2013-14 F700GS, 2008-14 F800GS, and 2008-12 F650GS Twin. 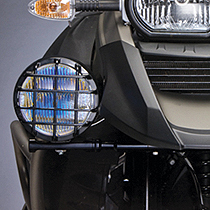 Kits range from our top-end Z6024 Auxiliary Light Bar Kit for the R1200GS/Adventure to the more simple Z6020-22 Light Clamp Kit that fits any 7/8" to 1-1/4" tubular handlebar, crash bar, or frame tubing. Pre-drilled Accessory Lighting Mounts offer complete versatility for placement, position and rotation of lights. 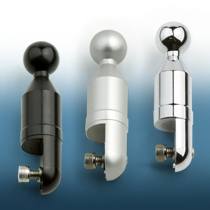 ZTechnik® Accessory Lighting Mounts are made from super-strong 6061 T6 Aluminum and Stainless Steel, and are finished in Anodized Black, with some mounts also in Anodized Silver or Brilliant Chrome. 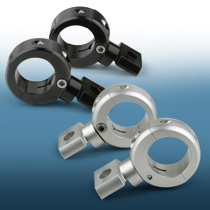 ZTechnik Accessory Lighting Mounts are made from super strong 6061 T6 Aluminum and Stainless Steel, and are finished in Anodized Black, Anodized Silver, or Brilliant Chrome. All screws and bolts are polished stainless steel. 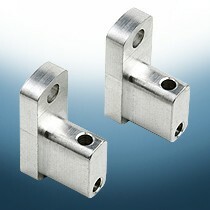 All Accessory Lighting Mounts include installation instructions and any required mounting hardware.